Bestselling comics writer Jody Houser and fan-favorite artist Rachael Stott launch the Doctor into a new universe of unforgettable adventure! Featuring Jodie Whittaker as the first female incarnation of the Doctor! 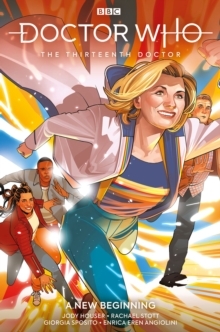 Bursting straight out of her hit new television adventures, this first collection of the Thirteenth Doctor's comic book tales is a scorchingly fresh incarnation, taking the show - and its comic strip adventures - where no Doctor has gone before! Facing off against vile villains and misunderstood monsters in flavours both human and alien, the Doctor and her friends must push the limits of time and space, confronting evils deliberate and accidental all throughout history - and uncovering secrets long-hidden and wonders never-seen along the way! Perfect for fans old and new alike, this is an awe-inspiring jumping on point to the Doctor Who comics mythos. Buy it, read it, then travel back in time to read it for the first time all over again...! Collects Doctor Who: The Thirteenth Doctor #1-4.